When another gift card, sweater, tie or toy doesn’t seem right, consider some whimsical art from Idaho. Over the next few weeks we’ll be showcasing some of our unusual & very limited creations available for prompt shipping. Pencil dimensions: 23″ long x 2 1/2″ diameter. Weighs apx 3 lbs. Carved of Idaho pine. Free personalizaiton of a name, date or short message can be painted along the shank of the pencil. Free shipping in continental US. Price: $49. Qty available: 1 only. To order: phone or e-mail us. A giant yellow pencil similar to this one hangs in our studio as a reminder, Dennis says, “that it often takes a big pencil to record big thoughts.” Without his giant yellow pencil perhaps the big beagle would not have been built! Part of the fun of gift giving is to totally surprise and amaze the recipient with a present selected especially for them. A present that shows you’ve spent time in choosing the perfect gift. Until now, only visitors to our Dog Bark Park studio and gift shop were able to purchase our one-of-a kind creations. Check our web blog frequently during the next several weeks to see more items that just may be that special gift. This fish is something to brag about! It’s 40″L x 4″W x 16″H – a keeper for sure. Apx 12 lbs. May be suspended using the attached hooks, or hung flat against a wall or building. The tail curves outward. 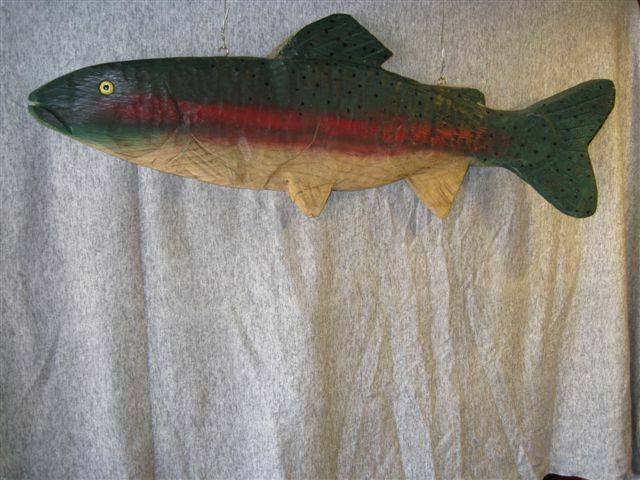 Back of the fish is flat and plain wood. Signed & dated by the artist, Dennis Sullivan. Free shipping in continental US. Price: $135. Qty available: 1 only. To order: phone or e-mail us please. Of course, our signature dog carvings can be ordered directly from our web store. We have many breeds on our shelves ready to ship at a moment’s notice. We’re happy to gift wrap and send directly to a gift recipient at no additional charge.